Firstly, I must apologise for the long delay in posting this guide. After I uploaded the introduction on March 6th, I was attacked by two masked people while I was relaxing at the dentists. Although I put up the best fight I could, they stole one of my teeth. The main attacker was a Caucasian male who drove an Aston Martin DB 9. He had bought it at an auction. How could I tell? Because it still had the little white label with the bar-code on, stuck to the bottom right of the windscreen. You can see one of these stickers if you click on the car in the picture above. Microsoft Paint is one helluva handy little program for airbrushing out details in photographs. But if you take a 500mg Amoxicillin, 1000mg Co-Dydramol and then pop 50mg of Tramadol, you will get the kind of sloppy results you can see in my picture. Assuming, that is, you can actually remember which room you put the damned lap-top in and can still work door handles. I took this photograph at an auction in the UK last week. 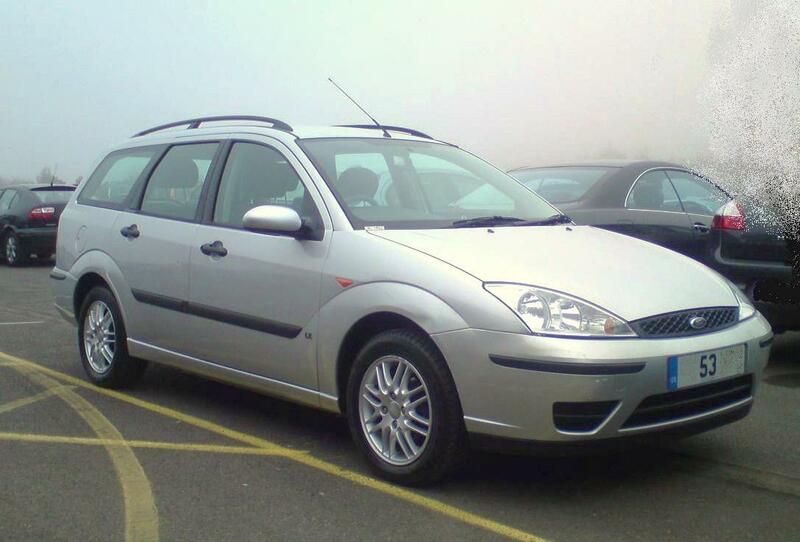 This 2003 Ford Focus 1.6LX Automatic Estate had just “had the auctioneer’s hammer drop on it” – a casual term to describe that binding and contractual sale made between the Auction House and it’s new owner who offered the highest bid. That owner was rushing off to get hold of the car’s documents while I went out and snapped this pic of their new possession. The car shown has air conditioning, alloy wheels, parking sensors, leather interior and holds a current mechanical safety certificate (MoT). It has six Dealer stamps in its Service Book, confirming that it has been driven only 35, 000 miles from new and was regularly serviced by its previous owner. It was sold for a “hammer price” of £250 ($396). You would be hard – pushed to buy a leather sofa for the same price as this entire car. The “hammer price” of £250 reminds us that the buyer will have to also pay a further ‘Buyer’s Premium’ to the Auction House – a commission that is charged on all sales. That will be another £200 ($317) making a total of £450 ($714) for the joy of driving that Focus away. Somebody just bought themselves a great little car for everyday use! The system just doesn’t work like that. So, the dealers held back and didn’t bid. The bidding “stalled”. Only the ‘private’ bidders (ordinary people like you and I) remained interested and only two people out of about two hundred were concentrating for that moment – about forty seconds – when this car was driven up to the stand. The auctioneer did what he could to raise interest but he can see a queue of eighty more cars waiting their turn and time is money. Lunch break beckoned. The car was sold. So, Rule Number One of buying at a car auction is that you have to actually be there with your credit card and your eyes and ears on alert. You can alternatively bid online but I would not personally recommend that. You can tell so much by simply ‘looking’ at a car up close and watching as it is started and driven into the queue for the podium. More on all those techniques in future posts. This year is proving to be a good year for auction bargains. Over-supply of new cars is resulting in huge discounting of cars that are three years or more in age. However, the increasing cost of insuring certain models is also skewing the market values of some cars. If you are walking down the street and you see a car that is similar to one which you would like to own, write down its registration plate details and then feed them in to an insurance comparison website ‘search’ page. That way, you’ll get its exact make and model details up on the screen. Speed-Dating. ← Car Auctions: Nightclubs for the over 25s…? Thanks, man. 🙂 I’m dying here…some bug going round. More to follow, soon!